EDM is a new technology which is totally different from mechanical processing. Today let's take a look at the characteristics of EDM. With the development of industrial production and the progress of science and technology, traditional machining methods can not be processed or difficult to process. The EDM method can meet the needs of production development and it shows many excellent performances in application. Therefore, it has been rapidly developed and widely used. 1.Pulse discharge has a high energy density, which makes it easy to process special materials and workpieces with complex shapes which are difficult or impossible to process by ordinary machining methods. It is not affected by material hardness and heat treatment condition. 2.The duration of pulse discharge is very short, the range of heat conduction and diffusion is small, and the range of material affected by heat is small. 3.When machining, tool electrodes and workpiece materials do not contact, and the macro-force between them is very small. Tool electrode materials need not be harder than workpiece materials, so it is easy for tool electrode manufacturing. 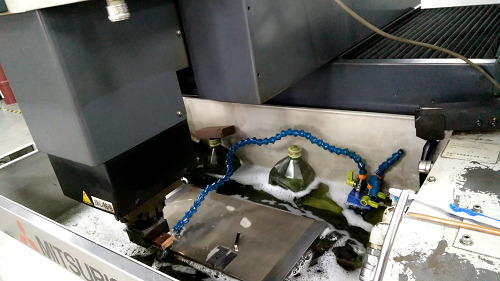 4.It can reform the structure of the workpiece, simplify the processing technology of EDM for mold manufacturing, improve the service life of the workpiece and reduce the labor intensity of the worker. The characteristics of EDM are as shown above. If you want to know more about EDM, follow us--YIZE MOULD.